Everybody knows about Nando’s Singapore which just opened here about a month ago, and has ridiculously long queues for dinner time. This time I happened to pass by Nando’s before noon and saw that there was no queue so I popped in to have lunch with my friend. 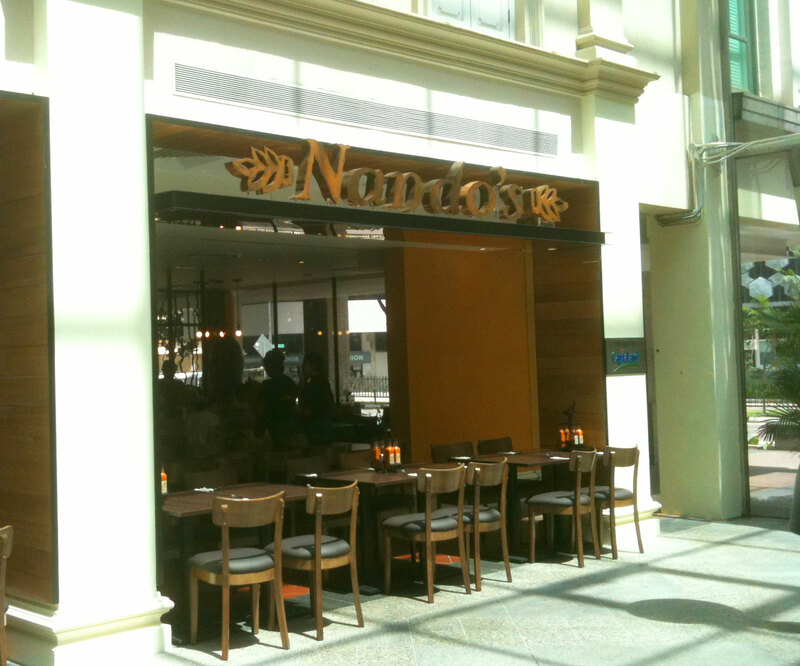 The interior of Nando’s is designed to give that warm feeling, quite fitting with their spicy food and Latin America theme. However one thing that I didn’t like is that their tables have a bar below that blocks your knees, which makes sitting in at the table quite impossible and uncomfortable. The classic order at Nando’s is their famous Peri-Peri Chicken. Peri-Peri is a kind of chilli that comes from southern Africa and was used by the Portuguese as part of the spice blends. Nando’s own Peri-Peri spice blend is a closely guarded secret, their version of the 11 secret spices of KFC. This being my first time to Nando’s, I ordered the recommended ‘Mild’ Peri-Peri level of seasoning for a quarter chicken with 2 sides – Peri-Peri fries and Mediterranean rice. Well, the Nando’s chicken lived up to the hype when I bit into that juicy thigh. Flame-grilled and seasoned perfectly, it was one of the best grilled chickens I had in a long time. Savoury with a hint of spice and lemon, the succulent flesh bade me to finish it to the bone within minutes. The Peri-Peri fries were excellent as well, dusted with their spice mix. But the Mediterranean rice was an extreme let-down, being just an ordinary bowl of butter rice with some corns, carrots and peas mixed inside. In what universe is that considered Mediterranean? However the main negative experience at Nando’s was the poor service of the Nando’s staff. This has been noted by many other people as well, but as far as I know, Nando’s has chosen to treat the complaints like they don’t exist – much like their service. We had to wait for 30+ mins just to get our bill and this was after hailing 3 different wait staff. And the restaurant was not really very crowded either. I know that we weren’t the only ones left out because I could see all the tables around me getting restless and constantly hailing the service staff. All I can say is that Nando’s is damn lucky their food is so good, because that’s the only thing drawing customers back. 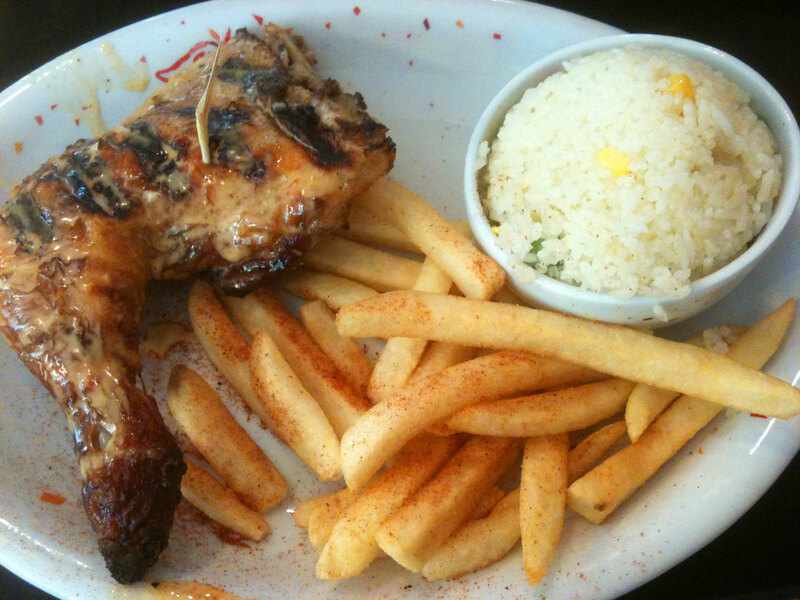 17 Responses to "Nando’s Singapore"
Yeah everything is pretty sub-par except for the chicken. I think most people just order the Peri fries for the sidelines and skip the rest. Real shame about that for Nando’s SG. probably should have tried Nandos in jb instead. it seems cheaper there, there’s no queue and the service was fantastic! we were just walking past having a look and the waitress did a great explaination on the food there despite us deciding in the end not to dine there. I think it’s tastier than Kenny Rogers leh! The sauce and seasoning is really yummy! 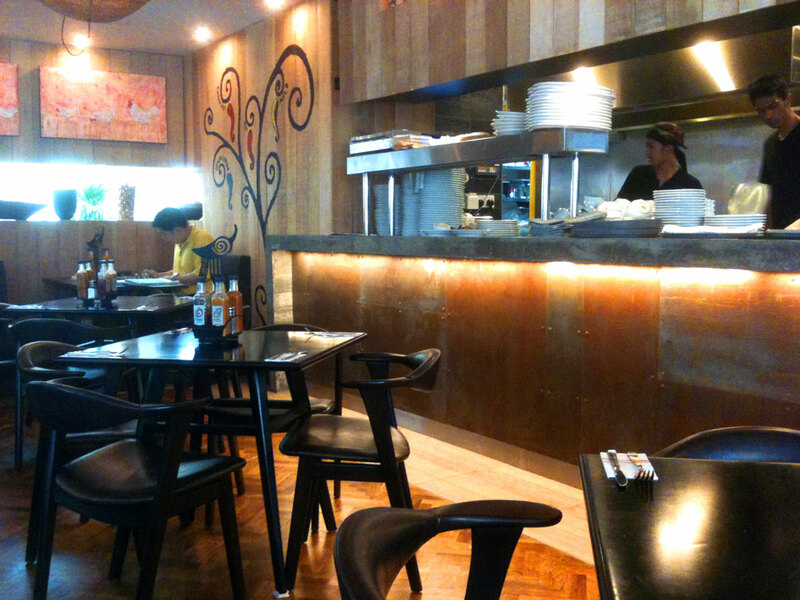 Just went to nandos with a big grp of friends (10 pax) & I have to say the service at Tanglin Mall is good! We had our food & bill promptly and we are gone in an hour. Ah I have not been to the Tanglin Mall outlet. It’s good to hear that their service is better over there. I’m sad to say the service level at the Bugis outlet hasn’t really improved since I last went. They have a lot of staff there but most of them aren’t really serving customers. So when I saw the outlet in Bugis Junction, Singapore, I was delighted, but disappointed with the tast of the chicken here :(. Ah that’s a pity. As it usually is, those food chains from overseas that open here usually don’t deliver as well as they do back where they come from. Went to Nandos this week and i must say i was rather dissapointed in the qulaity and value for money aspect…Barcelos is far better on both fronts and Barcelos can make a simple product into something very appealing…even their salad was delicious! !… Barcelos rocks..sorry Nandos but you dont get my vote. Your comment is very accurate and i totally agree that Barcelos Rocks…. im assuming your referring to the vivo city one as that is my favourite…im actually going there tonight… cant wait! Gd Day! Can I please know is Nando’s in Singapore Halal?? we usually have it in Jb its very good n Halal too. Sorry I have no idea about that but you can email them at peri-peri@nandos.com.sg to ask.